Oh. My. Lord. Keep the car in the garage. 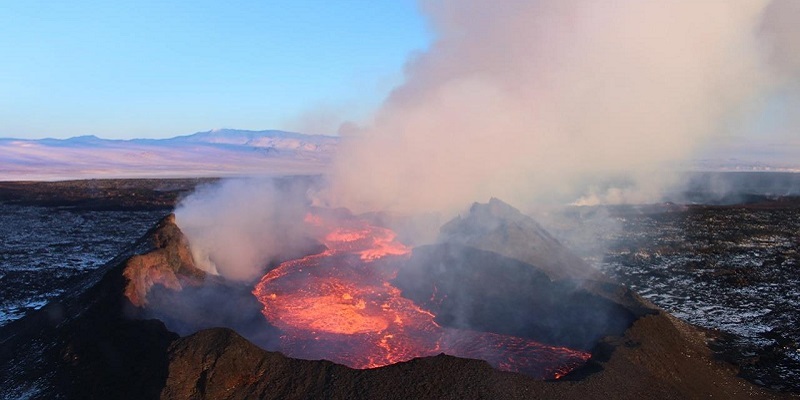 The study examined Icelandic volcanic ash preserved in peat deposits and lake sediments and identified a period of significantly reduced volcanic activity between 5,500 and 4,500 years ago. This period came after a major decrease in global temperature, which caused glacier growth in Iceland. The findings, published today in the journal Geology, found there was a time lag of roughly 600 years between the climate event and a noticeable decrease in the number of volcanic eruptions. The study suggests that perhaps a similar time lag can be expected following the more recent shift to warmer temperatures. It’s amazing what you can achieve when you take a simple correlation and run with it. Look out, we may set off a deadly volcano spiral feedback: cars leading to more volcanoes, which put out more CO2, causing more warming, which causes more volcanoes. For the past couple of months the crater lake temperature has also held steady at about 37°C , which is at the upper end of its scale. Fine weather allowed GeoNet to make airborne gas measurements and these recorded high levels of carbon dioxide, sulfur dioxide and hydrogen sulfide emissions from the crater lake (Te Wai Ā-Moe). “The CO2 emission rate on 23 November was 2290 tonnes/day, one of the largest values recorded in recent years. Can someone figure out how many cars will have to stay off the road in NZ today to make up for the volcano? UPDATE: Thanks to Neil - New Zealand has to get 458,000 cars from the roads tomorrow to offset the crater lake emissions. The total NZ car fleet is 5,021,994 cars. So that’s nearly 10%. This one volcano is undoing quite a few years of vehicle efficiency gains, and it’s not even very active. Douglas links to a cartoon take: “Let’s tax that Volcano”. “The Arthur Daley Climate Fund for All Earth Life Survival, is proud to announce its new CEO. A big round of applause as he steps forward.. Mr Swindle. If this is a mystery Arthur Daley is the ‘rogue’ business opportunist of the TV show ‘Minder’. Everything is an opportunity to make a quid and if it happens to be dodgy.. well the more the merrier. Arthur was a Quote Master..consider them and Climate organisations as you read..”You only get out of life what you put in and a bit more if you can find a couple of mugs.”..”Terry My Son..You make contact with your customer. Understand their needs. And then flog them something they could well do without.”……. That just about sums up the Climate Conference attendees but after Arthur, or any Climate Conference delegate, shakes your hand best count your fingers. That was my first thought as well. Could any scientist (and I use that term loosely) be more aptly named? Could one of the CO2 panic merchants please explain to me, preferably in words of less than 1 syllable so that even I can understand it, how human emissions can possibly wreak all the projected havoc routinely put forth by said panic merchants? Given that humans are only responsible for approximately 3% of emissions from all sources, and that total increases in CO2 have stood at a linear rate of 2ppm pa for a number of years, humans are responsible for only 0.06% of that total, so, how can they possibly be responsible for the havoc claimed for them? Please provide experimental and/or observational evidence, plus a full workout of the thermodynamics to support the hypothesis. It’s the vibe of the thing , how’s that for an explanation. It is all quite simple really. There is a pragmatic answer to all of this. A certain percentage of potential University Students choose to do Arts subjects, because they don’t feel for mathematics. Another percentage of potential University Students Choose to do Sciency subjects, primarily because they can’t draw or play an instrument. There is no guarantee that the science students can do Maths, but they are prepared to give it a go, because it is better than playing a tambourine. Now both groups get the idea that volcano’s are hot, due to the processes required to make lava, for lamps. But once the lava is in the lamp, you need to use a CO2 extinguisher to ensure that it doesn’t escape. And so both groups have concerns that the lava will escape into the atmosphere, instead of being in the lamps. It is no fun, being in University in such a creative age. There is much to worry about. People must surely be getting sick of everything being blamed on climate change. The Bali volcano must the the extreme example, as all the ice has disappeared from Indonesian waters. Our curtains have faded….must be climate chnage. We should mock the climate change religion loudly and frequently…otherwise it will become taken seriously…. Steve, I am sorry to have to break the news to you. But there is no known cure for climate chnage. Or dyxleksia, for that matter. Original Steve , those faded ciurtains of yours were due to Daylight Saving which created a whole lot more problems than Climate Change has done so far. Icelandic glaciers are known to “surge”; i.e. exhibit highly irregular bursts. Temperature records for Iceland have been adjusted to suit politics. Several times. Here is a video of glacial surge. It is annoying to watch for reasons that will become apparent but it demonstrates the concept. 50m a day is frightening. Some days, I don’t get to move that far. How about we just reduce Co2 levels down to below 100 ppm and then all our problems will be solved for good ! How about the whole world throw all the cars into active volcanoes to please Gaia? That makes just as much sense as the nonsense coming from catastrophic global warming scientists. If the new socialist green Labor government in NZ was truly concerned about CO2 causing global warming it would be buying Carbon off-sets either on the international market or domestically. Our previous Climate Change Munster, Her Royal Thighness, Ms Pulla Benefit [sic], discovered NZ had purchased shonky ™carbon credits™ via Russia, which proved to be as worthless as the paper they were printed on. Shocked, I tells ya! This happened under the watch of ex-Dear Leader John “Brighter Future” Key, who was “very good friends” with a certain US Secretary of State at the time: one H. R. ‘Pufnstuf’ Clinton. All they need to do is make it ILLEGAL for volcanoes to emit CO2. Fine ‘em if they don’t comply! Gaol ‘em if they don’t pay the fine! That’ll learn ‘em! Yep, in 2016 the average fleet emissions (Australia) was 120g/km of CO2, the average passenger car travels 15,000 km/year, which is 1.8 tonnes/year, 5 kg/day so you would have to remove 458,000 cars from the roads to offset the crater lake emissions. Worldwide volcanic CO2 is orders of magnitude greater than Warmist “scientists” admit. The total NZ car fleet is 5,021,994 cars. So that’s nearly 10%. Cheers, added to the post. Here’s another way to look at it, NZ has approx. 84 active volcanoes, Mt Ruapehu is average, assuming they are all of similar size you would have to remove about 40,000,000 cars to offset their emissions. Aus and NZ combined have about 21 million cars, all of Australasia has less than 30 million, and a lot more volcanoes. Oh my lord indeed Jo. Amazing what gets published in the scientific journals now. Even the once reliable journal Geology has been infected. No doubt this was peer reviewed before publication! Facts are: CO2 is a small percentage of volcanic gas. The major emissions from volcanoes are water vapor (steam) and SO2 that produce cooling in the atmosphere. We see this effect after big eruptions when temperatures world wide fall for a period of months after the event. So logically to save the planet from the global warming monster we must actually drive our cars much more so as we can have more volcanic activity and thus reduce the global temperature from the dangerous man/woman/LGBTI-made disaster we are causing. Right? The scientific age is over and now village idiots are running the Universities, government, big businesses and the media. All is lost! Welcome to the Neo Stoae Age. Don we have had the cretaceous age we are now in the cretinaceous age, the agenda now in most countries is set by cretins. But isn’t it true that most carbon (99.9%) is now contained in limestone and sediments, and that carbon came from CO2 in the air and originally out of volcanoes and other emissions from the earth’s crust? Retreat to islands of intellectual excellence in an otherwise grey panorama of mediocrity with oceans of stupidity. Its a kind of ideologically created global idiot savant. Sorry Manfred, accidental touch on red thumb. The route to academic success is paved with “blame it on climate change caused by humans”. Problem is the current quiet sun. Lack of sunspots indicates low magnetic activity allowing Earth’s magnetic field to relax a bit. This allows more cosmic rays to reach the upper atmosphere creating more cloud cover. Excellent cooling effect. Earth’s changing magnetic field will effect magma flow down in the molten interior. If there is a way out, up it comes. More volcanic activity. Dust and gases give more cooling. The powers that be know this. They must keep the populace distracted to keep the green energy revolution rolling, because when the snow and ice does come green energy shuts down. As DonS says above, “Welcome to the Neo Stone Age”. The aptly named Swindles understands all this…but he also understands which side of his bread needs buttering. Facile and puerile, but strangely irresistible. Swindles is as swindles does. Whether true or not, there is some interesting footage of sinkholes in the video. The gravitational interaction between the earth and moon can also vary by 47% due to lunar precession which will cause earthquakes and volcanoes. Cars causing volcanoes and bearded dragon lizards getting dumber!! Its not even correlation – there is a time lag of 600 years! How can anybody – seriously, actually, really – believe this stuff? There seems to be quite a few AGW nutters from Leeds Uni. Maybe it is some sort of paras-ite or something in the water? More like Paris-ites at the trough. Just watch how fast the Maoris disown it after years of talking it’s religious meanings to their culture. Every religion requires at least one god, at least one Satan. While liberals decry the world’s religions (or decry just Christianity, at any rate), they have created a new religion. Powerful government is their god. CO2 is their Satan, and gets blamed for all evils of the world. Increasing volcanic activity under Iceland and West Antarctica leads to snow and ice melting, which leads to some people to lose their intellectual judgement, running around in circles and screaming ‘Global Warming’ and proposing inappropriate actions. aren’t you assuming that they were capable of intellectual judgement in the first place? Mt Ruapehu has regular coughs, snorts, farts, crater lake ejections and minor eruptions every few years. It’s an active volcano, so it’s not surprising. The one gas emitted, which nobody should ignore, is hydrogen sulphide. It’s the smelly one and can be toxic in sufficient quantities. Small quantities can be irritating. Basically, it’s a health hazard at all but background concentrations. When it’s around, ensure buildings are well ventilated to keep it from accumulating. It’s what gives the North Island city of Rotorua—also known as Rotten-rua—it’s distinctive … aromatic character. Local articles seem to have focused on the mountain’s CO2 emissions. CO2 is harmless plant food so the tussock grasses around the mountain will be ecstatic at this enrichment of their diet. So will the carrot growers of Ohakune. Could make for a bumper crop by the end of summer. It’s the H2S emissions which are not harmless and they’re the ones people need reminding about. So…ummm…. what caused the volcano in Pompeii? The Russians – they hacked Vesuvius apparently! I hope all you Kiwis out there are pleased with yourselves. Your volcanic emissions have caused a lack of cyclones and hurricanes too. The Southern Hemisphere is worst hit so obviously it’s New Zealand’s fault. I’m sure your new enlightened PM Ms Thingamyjig Wotsaname will be on the job to rectify the tectonic situation as a priority. STOP CONTINENTAL DRIFT NOW I say! Sorry to hear about the Wellington quake too. The CO2 emission rate on 23 November was 2290 tonnes/day, one of the largest values recorded in recent years. More and more deliberate scam! A ‘tonne’ is a ‘weight’ and the atmosphere exhibits no wight only pressure, Archimedes 272 BC. Even if that were expressed as (2290 kg/day) it would still be high by a factor of 3. Your meteorological Climate Clowns cannot even calculate atmospheric mass correctly from surface pressure. Claimed 5.2 x 10^18kg! What fools! Gross incompetence. For science, the correctly calculated mass of the ocean’s water (incompressible fluid) remains at 1.5 x 10^21kg, 14.7 x 10^22tonnes weight! Mass of Earth’s atmosphere remains approximately 0.1% of the mass of Earth’s oceans. Has anyone bothered to figure out WHY? At the moment, about 7% of the world’s electricity consumption is taken by our digital ecosystem but this is forecast to rise to 12% by 2020 and is expected to grow annually at about 7% through to 2030. According to one estimate (LINK), bitcoin mining is now consuming more electricity than 159 countries, including Ireland, Bahrain and the Slovak Republic. The same source reckons that it’s currently taking as much electricity as would be required to power 2.7m US households and that it’s responsible for 0.13% of global electricity consumption. If things go on like this, bitcoin mining will require all of Denmark’s electricity consumption by about 2020. Britons faced travel chaos this morning after sub-zero temperatures and wintry conditions led to last-minute cancellations and delays of up to 90 minutes on a number of rail services. Yellow weather ‘be aware’ warnings have been issued across parts of England, Scotland and Wales today after a combination of freezing temperatures and showers mean there is a high risk of ice. Temperatures overnight dipped to -6.3 degrees Celsius in Topcliffe, North Yorkshire last night – making it the lowest temperature of the Autumn so far. Meanwhile temperatures in Benson, Oxfordshire and Drumnadrochit, Scotland plummeted to -4.9 degrees Celsius. Ah, but it’s summer in Antarctica. Dr Thomas Waite, Public Health England’s Extreme Events team: “We know that every winter thousands of people fall ill and many die because of exposure to cold both in the home and while outdoors. Britain risks a repeat of some of the 2010 mayhem – with snow and ice risking chaos for travel on roads, by trains and planes. It is also feared the colder-than-usual weather could kill as many as 40,000 Brits this winter. The Weather Company senior meteorologist Mark Stephens-Row said: “The UK’s first colder-than-average December since December 2010 is expected. Office for National Statistics figures showed 20 per cent of winter deaths are people aged under 75, with 11 per cent under 65. Department of Health chief medical officer Professor Dame Sally Davies, writing in the Cold Weather Plan for England 2017, said: “There are around 25,000 excess winter deaths each year in England. BRITS will shiver in a killer freeze this week. And snow and ice are due to bring chaos as far south as Essex by Wednesday. The bitter temperatures have seen bookies Ladbrokes slash the odds of a white Christmas yet again, to 8-15. The Met Office said -7C nights are likely on Wednesday and Thursday. Even the highest expected daytime temperatures of 3-6C in the UK will feel like -1C because of windchill. Met Office forecaster Luke Miall said: “It turns cold again from Monday afternoon and stays colder than average for up to 10 days, with winds from the Arctic. Ah, a good long cold spell (not snap!) in the UK. What with our nice warm weather here atm I’d say the planet is balancing the books very nicely? comments re UK freeze keep going into moderation. Heading into next week, the Met Office warned of snow as far south as Essex by Wednesday, with the East, Northern Britain and Wales all due low-level snow near coasts. While temperatures will remain similar to the 3-6C that most of Britain felt during the day this weekend, the bitter polar winds next week could make it feel a bitter -1 to -2C. Rail travel was disrupted on some southern and south eastern services on Saturday morning and National Rail advised passengers to check their routes before travelling on Sunday. A Network Rail spokesperson said: ‘During low temperatures electrical third rails, which power trains in parts of the country – mainly the south of England – can become icy, preventing trains from getting power. ‘De-icing trains run overnight to keep the rail free of ice but services can be affected.’.. The total NZ car fleet is 5,021,994 cars? Make that registered vehicles perhaps. And if that little dark secret was not bad enough, NZ’s largest import expense category is petroleum and petroleum products, followed in second place by vehicles and machinery. I have lived at sea level on Tuggerah Lakes since 1986, most of which time, I have been keeping a wary eye on the water levels, but at the moment it looks like it is further down than I can remember. Perhaps that also causes volcanoes?? So who was revving their vehicle today? This is according to Sutopo Purwo Nugroho, head of information and data for Indonesia’s National Disaster Management Agency, Red alert issued as ash from Mount Agung rises 4,000 meters (about 2.5 miles) into the sky. Now I know why all the volcanos in Victoria are extinct, the Aboriginal ran out of fuel for their cars. The theory goes that high speed solar windstreams trigger earthquakes and low solar activity triggers volcanoes. Noting that the last 3 weeks or so have seen just two isolated sunspots, with the current eruptions are we seeing the start of solar minimum related eruptions? I feel no guilt at all. I don’t mind paying the extra in fuel…. to do a good thing. A – why don’t they blame the volcanoes for melting ice? B – they are already active… active is active…. C – I love the way they cannot talk about “climate change” without automatically adding “man made”. “Climate change caused by humans is…” – so ALL climate change is caused by humans? There is no change caused by anything else? If they say that there is – how does the ice melt differentiate between “man made” and “natural” then? Or is it that if the ice melts than that MUST be “man made”? Have you read this? Obviously something our friends in NZ should consider. The propensity for AGW Climate scientists to associate any “match” of some linear behavior with their idea of what is actually happening in our climate is and has been very disturbing. The rush to form a conclusion from this type of singular methodology and data is beyond any of us simple folk (non Docterate).